The hotel was burning merrily when Mhumhi glimpsed it again between two streets- a distant flickering blaze. They had paused to rest in front of the building with the yellow stripes, which thankfully had not taken them much time at all to reach. There was a large metal statue of a dog in front of the building, and he had climbed up to stand on the high vantage point on its back. “Anyone following?” asked Kutta, looking up from where she was sitting by the statue’s massive paws. She was still wearing her harness, as Mhumhi was wearing his- Mini had convinced them all to keep them on, pointing out that it would be much easier to transfer between walking and pulling the cart without having to strap in. As usual, her words made a good deal of sense. Mhumhi just didn’t like the unpleasant reminder of the straps as they rubbed against his fur. “I don’t see anybody,” said Mhumhi. Indeed, the city beyond looked deserted- the blazing beacon of the hotel was the only sign of movement. He supposed it had deterred the painted dogs after all. He was rather deterred, traveling with such a little pyromaniac. The hot wind that was blowing was making the inside of his nose dry and sore, making it hard to detect any scent. The metal he was standing on was quite uncomfortable for his paws, too. He hopped down, panting. “A minute or too,” said Mini, and she leapt lightly down from the cart. “It’s been a long time since I used a computer.” She trotted over towards the building’s glass doors, sniffing. Mhumhi eyed her a moment, then trotted to rear up and look at Maha and Tareq. Tareq seemed sleepy, curled up beside Maha with his eyes half-lidded. Maha’s eyes were open and hazy. Mhumhi shifted to gently lick her cheek, and she flinched. Her bite wounds were swelling up, looking horribly sore. Her skin tasted salty with sweat. “How is your arm?” he asked her, softly. He stopped himself from licking her again, trying to bite down on his own feeling of trepidation. “I like Mini,” Tareq informed him, making Mhumhi narrow his eyes slightly. Mhumhi glanced at her wordlessly, and she furrowed her brow and swallowed. “But we can’t just leave them alone,” said Kutta. Nobody had to answer that, for at the sound of his name the hulking form of the hyena emerged from behind the cart, the rings on his harness jingling slightly. Tareq gave a little whine at the sight of him. They managed to convince him to get out and help hook them all back in, and then they took Mini’s directions around the building to a low-slung parking garage, all quiet concrete and echoes. It was cool and dark within, with a few caged lights dimly illuminating rows of rusting cars and what Mhumhi thought might be a few more empty dog-carts. In the gloom they found what Mhumhi recognized to be the shiny silver doors of an elevator. Mini leapt out of the cart again to sniff at them. “This should take us up and inside,” she said. “Tareq, help us out of the cart again,” Kutta called, panting. Mhumhi put his head up over Vimbo’s shoulder- she looked weary, and who could blame her. They had been moving nonstop for a some time with little rest and no food. Mhumhi himself felt an exhaustion threatening to creep up on him the moment he held still long enough. “I don’ wanna,” said Tareq, from within the confines of the cart. Mini walked around and yapped at him. Tareq sniffled and got out, jerking angrily at their harnesses as he freed them. Kutta tried to lick his swollen cheeks, but he covered his face with his hands. “You never told me exactly what this building was,” Mhumhi pointed out, glancing at the closed silver doors. “Oh, then let’s go get it,” said Mhumhi, wagging his tail a little. trying to maintain the image that he knew exactly what was going on. Mini gave another little sneeze, perhaps a derisive one, and then went over to the elevator and sat down underneath the doors. The hyena lurched to his feet and walked over to her, bobbing his head. Mini tilted her nose upwards, pointing at the buttons, and said something to him in hulker. Mhumhi watched, bemused, as Vimbo surged upwards to jab at the buttons with his nose, then dropped down again, keening and flattening his ears. She had certainly got him under her spell. Mhumhi looked back at once, ears rotating forward. That had been Maha. She had struggled to sit up in the cart and was now frowning at him. Maha frowned again. The expression seemed painful on her swollen face, and Mhumhi licked the air, wishing he could ease her pain. He felt like flinching. “I made a stupid mistake. I thought I could come back for you.” I thought you were safe. I was frightened for myself. Those words he was afraid to add. Even bleary and bloodshot as they were, Maha’s eyes still had that sharp glint to them, and he felt uncomfortable when they flicked over him. There seemed to be words at the tip of her tongue- and then she seemed to change her mind. “I tried to talk to the police when they came for us,” she said. Mhumhi was not sure what to say, so he kept silent. Maha seemed to have recovered a bit of strength, and she kept talking. She scowled, or tried to. She broke off, her chest rising and falling. Mhumhi gave a little whine, shifting his paws where they hung over the side. Tareq, who had before been listening quietly, suddenly clapped his hands over his ears. I’ll kill him, thought Mhumhi at once, and then thought, but he might be dead already, if he’s the one I killed. That made him feel unpleasant and strange. He saw from Maha’s eyes that it was not quite the right thing to say, and he turned the words over in his mind- maybe they were a little bit true, but mostly false. “Mhumhi,” Mini yapped. Vimbo was standing half in and out of the elevator, which had opened, though the doors kept sliding forward and threatening to shut on his spotted pelt. He turned back to Maha, loathe to leave her, but she had closed her eyes. Maha spoke without opening her eyes. Mhumhi whined as he got down, slinking towards Mini. The little dog said nothing, only stared at him a moment, then turned and said something to Vimbo. The hyena stepped backwards out from between the doors, giving out little grunts. The elevator shut away the sight of Kutta, Vimbo, Maha, and Tareq. Mhumhi licked his lips and sat down. 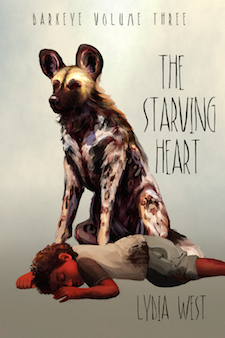 “I didn’t know a wild dog could love a human,” said Mini, as they rose upwards. Mhumhi did sort of know, in a level in his brain he preferred not to acknowledge. “She won’t be a puppy forever,” Mini pointed out. Mini gave a little snort and wagged her tail. They let the subject drop, watching the buttons on the inside of the elevator light up in tandem with their upward movement. Mhumhi was surprised to feel how companionable the silence felt. He had been beginning to suspect that the little domestic was insufferable as well as surprisingly dangerous, but perhaps it was not so. She could be quite easy to get along with. The silver doors slid open, revealing a pitch-black room beyond. Mini trotted in without hesitation, her little black shape being more or less swallowed up by the darkness at once. Mhumhi lowered his head and stepped nervously out of the elevator. The room felt large and airy, and he could not quite make sense of the interior- it seemed that there were many obstacles within, dampening sound echoes. He wondered at the human tendency to build tall things in rows. The elevator doors slid shut automatically behind him, and Mhumhi turned around rather despairingly. That had cut off the last little bit of light- now he was bumping around in total darkness. “Ah,” he heard Mini’s voice say, just before there came an alarmingly loud clatter. “Are you all right?” he called, rotating his ears to try and get a lock on her. “Yes, yes,” she said. “I just realized that we don’t have to look for it. This is a modern building.” She added a few words in hulker language. Mhumhi was about to ask just who she was using that for when the lights all came on at once in a dazzling blast of white. He flinched mightily and rubbed his smarting eyes with his forepaw. “Oh, sorry, sorry, should have warned you,” yapped Mini. He lowered his paw and squinted upwards to see her sitting on what looked like a desk a few feet away. The room, lit up, seemed to have a lot of these desks, some even boxed up in partitions that blocked the others from view. On the desks there seemed to be screens. Mhumhi looked around himself at all the boxed desks with all the screens, and gave up on even feigning the knowledge of what she was talking about. “Well,” said Mini. There was a pause, in which she turned her gaze down to the desk a moment, then back up at him again. “And…?” Mhumhi prompted, after she had been quiet for a little while. “bursting to say that, It’s sort of” it’s shouldn’t be capitalized.